If you like the exterior of Cine Doré, this 1920s cinema, wait until you see the interior! The main screen has an ornate ceiling, painted turquoise with dark blue and gold details; it’s gorgeous. The past is palpable — you feel as if you are stepping back in time. There is an outdoor screen too, for the summer; there’s nothing like enjoying a drink and a classic movie on a hot Madrid night. The cafe is a great place to have a pre-film drink or coffee, with its period furniture, chequered floor, white columns and palms. 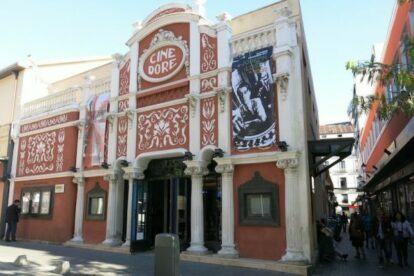 This cinema is run by the Spanish Ministry of Culture and has really interesting cycles, with several always running at any one time. There is something for everyone. All foreign (not Spanish language) films are in the original language, subtitled in Spanish. Also, the price of 2.50 is pretty unbeatable. You have to buy your tickets there, at the little window at the side of the building – everything about this experience feels old world. I love this place; can you tell?